Stratford-on-Avon Mop Fair has its origins in hiring agricultural and domestic labour, set out some time during the reign of Edward III and provision of the statutes of labourers and as a pleasure fair it remains a key date in the Warwickshire calendar. In the 1950s, during the prominence of railway travel, a plethora of special trains were laid on to ferry the local population to and from the fair. Stratford Mop has an associated ‘runaway mop’ one week later. The tradition of this is from the need for employers to reconsider and re-hire any staff before committing to a full years work. This street fair has a tradition of exciting and up-to-date riding machines, as well as maintaining loyal old-fashioned rides. 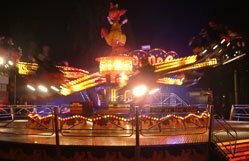 The fair is also renowned for the open roasting of pigs and oxen, and the atmosphere remains at a premium right up until its midnight closure.